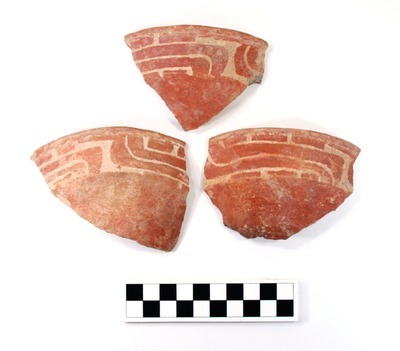 "Hyte, 2003.08.1106" by Timothy K. Perttula and Robert Z. Selden Jr.
DECORATION (INCLUDING MOTIF AND ELEMENTS WHEN APPARENT): The vessel has a red slip on both interior and exterior vessel surfaces. The rim panel has an engraved horizontal and curvilinear scroll motif repeated four times around the vessel. The motifs are divided by large excised brackets.